If you want to cook jerky in a food dehydrator, then firstly you have to buy a good jerky cutting board and a knife also. It is not compulsory that you have to buy these products, but they eventually benefit you in cutting perfect jerky slices which you might dry out in a food dehydrator later on. The maximum number of chefs or cooks uses such products to give a professional look to their foods. It not only makes your work easier but also provides you a sense of satisfaction in the end. However, there are very fewer companies in the market which manufacture these products. But don't worry! In this article, we will discuss the three top best jerky slicer board and knife which you can buy from the market easily and at a very reasonable rate from the online shopping websites. The first name in the list is "Hi Mountain Jerky Board and Knife Set." The company “Hi Mountain” is one of the main manufacturers of Jerky Cure as well as Seasonings for persons who want to cook jerky at their home. It becomes very easier to prepare jerky with these amazing jerky cutter at home now. It comprises of all essential things like hardwood cutting board having depths of ¼ inches and 3/8 inches, customized small surface and a razor sharp knife. Besides all these important parts, the manufacturer also provides inserts for subtle slices of vegetables and meat, spices of original jerky, and steak flavor. This product is manufacture in the USA. It consists of a dual-sided hardwood board for jerky cutting. The every single side of the board manufactured for cutting a proper thickness. The buyer will also get a custom-made deep-ground knife. You also get different types of seasonings along with the product that will help you in making your recipes more delicious. The jerky cutting board and the knife are quite easy to use. Both things are manufacture from well-made and robust quality material. It is also a great substitute for the full-sized meat slicers. This product is not suitable if you want to cut jerky in bulk quantities. In fact, you can use an electric slicer in its place. A quite large piece of meat is used while cutting as it's tough to hold a small size piece on the board. The second name in the list is of TSM Products Jerky Cutting Board and 10-Inch Slicer Knife. Both products i.e. cutting board as well as knife are excellent tools for preparing jerky by cutting strips of entire meat. The jerky cutting board is made up of stainless steel material which is pre-set for cutting 1/4 inch pieces for ideal jerky dehydrating. You can also adjust the cutting thickness of the food with the help of a food grade plastic insert. You can wash the cutting board along with the knife in a dishwasher for stress-free cleaning. It is a unique jerky cutting tool that helps in cutting thin strips of the jerky or meat. It is manufactured from the durable food grade stainless steel. The top rack of the board is dishwasher safe which saves your lots of time. The knife is already pre-set for cutting 1/4 inch slices of meat. A food grade plastic insert is also given along with the products for altering the thickness of slices as per your requirement. The knife is made up from Stainless Steel which offers more durability. Both products are quite stress-free to clean as it does not grasp any meat leftover or jerky blood which certain woods can. The board also possesses a slot for keeping the knife which is quite useful. It does originate with two parts of plastic that help in adjusting the thickness of the meat’s cuts. Since both products are not too much large, so you can store it easily anywhere in your kitchen. It is the best product for preparing homemade jerky. According to the price which the manufacturers offer, these products are quite affordable. You can easily use both products without any much guidance. While using these products, you have to be sure that the jerky or the beef needs to be thicker. If the jerky is already very tiny, then you will not be able to cut it correctly. The welding work of the product is very rough which you might feel while using. It is a typical "Made in China" product which is not correctly manufacture. The plastic handle mold of the knife results in an uncomfortable feeling while cutting the jerky. The third name in our list of top 3 Best Jerky Cutting Board and Knife is Jerky Board Knife Set Slicer Cut All Meats Beef Chicken Pork Recipe USA Made. 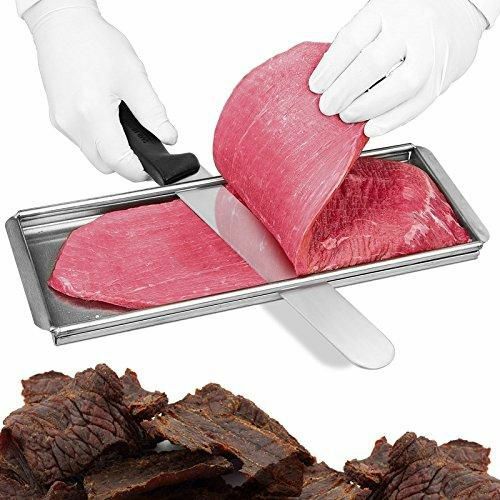 It is not mandatory that you use it for cutting jerky slices only; in fact, you can slice turkey, vegetables, fruits and ham with this product quickly. The product is 100% dishwasher safe. This Jerky board also does not dull or destroy your knives even after a long term use. This product comprises of a Jerky Board as well as slicing knife set which helps in cutting 1/4" or 3/8" thick strips of meat perfectly every time you use. It is manufactured from the High Quality ¾ inches HDPE material which primarily comes to cutting board. The cutting board works best when you use it with a thin blade scale style knife having a size of 8 inches blade or even longer. The product works perfectly for the first time users. The knife is manufactured from 420-grade stainless steel. The knives are made up from solid stainless steel design so that you do not have to get worried even if it falls. It is very easy to hold and use this product owing to the standard blade thickness as well as exclusive design. In manufacturing the handles, the Polypropylene plastic is used that offers high flexural strength and resistance to moisture as well as acids. You cannot wash this product in a dishwasher as hand wash cleaning is highly recommended. You have to instantly dry the product with a napkin to avoid the occurrence of the rust. 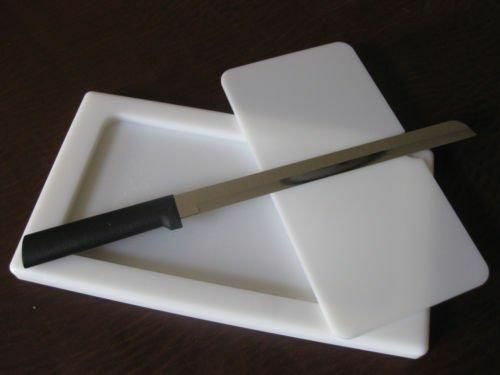 The jerky cutting board and knife must be manufacture from the durable and long lasting material. There are some products which are made from a very cheap plastic material that can be easily torn out or get broken easily. Same is in the case of knives. If a knife is made from stainless steel, then it will not affect by rust and all. The cutting board comes in different sizes. Thus, you must buy that product which is not only smaller in size but which you can easily store in your kitchen. In fact, the size of the blade of the knife must also be appropriate for cutting any meat and not only jerky. The board and the knife must be easy to use. We want to say that if you are using these products for the very first time, then you must feel an easiness to use without any guidance. The board, as well as the knife, must also be dishwasher safe. It not only saves your lots of time but also helps you in removing any hard stains. Thus, before buying these products, you must always check whether they can be the wash in a dishwasher or not. There are few manufacturers which provide limited warranty period offer on the jerky cutting board and knife. The warranty period not only makes you feel safe while buying this product but also build up a faith towards the manufacturer of the product. Q: Is It Compulsory to Buy a Jerky Cutting Board and Knife If I Want to Cook Jerky in a Food Dehydrator? No, it is not mandatory to buy a jerky cutting board and knife. You can only cut a jerky with any knife at your home. But jerky board and knife provide you a sense of perfection while cutting the slices of the meat. Q: Is It Expensive to Buy a Jerky Cutting Board and Knife? Q: from Which Material, a Knife Shall Be Manufacture so That It Does Not Get affected by the Rust in the Long Run? Well! It is beneficial if your knife is made from the stainless steel material of this type of material does not affect by the rust in the long run. Q: I Want to Buy a Jerky Board and Knife but for a Novice User Like Me Would That Be Easier to Use? Yes, of course, you can easily use both products without any guidance. It is very easy to use the cutting board and knife. If you still have any doubt in mind, then you can read the instructions given in the manual book. Q: Does all the Jerky Cutting Board and Knife are Dishwasher Safe? If No, the How Will You Recommend the Cleaning such Products? No, all jerky cutting board and knife are not dishwasher safe. You have to read the features of the products to know about this condition. But still, if they are not dishwasher safe, then also you can clean them with the help of a lemon and water. It not only cleans out the stains easily but also helps in better cleaning. Q: from Where Can I Purchase Jerky Cutting Board and Knife? Well! There are lots of famous online shopping websites from where you can buy this product like www.amazon.com . Q: While Using the Knife, Its Plastic Handle Gets Broken. Can I Replace It from the Manufacturers? The plastic covering of the handle can easily change from the market. We don't think so that in such a case, the manufacturer will replace your whole product. In the end, we can say that a jerky cutting board and knife plays quite an important role if you want to cook jerky in a food dehydrator. It not only uniformly cut the slices of the jerky but also provides a professional look to the food in the end which you might found in the jerky that is available at stores. In the above article, we have honestly reviewed the top three best jerkies Cutting Board and Knife. You can choose the product which closely matches your need and requirements. We are sure that once you buy any one of this product, you will assuredly get amazed from its benefits.